Think You Know Alexander Hamilton? Read This Before You Answer. When looking for a kick-back summer read, most of us resist an 800+ page boulder of non-fiction. 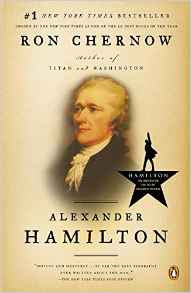 Yet since I am unwilling to plunk down an ultra-serious chunk of change for an elusive ticket to Broadway's smash hit, "Hamilton", I decided to take the plunge into Pulitzer Prize-winning author Ron Chernow's best-selling biography of our country's most misunderstood and underrated Founding Father, Alexander Hamilton. Most of us know little about Hamilton other than that his face is featured on ten dollar bills and that he was shot by Aaron Burr. He was more...so much more. Brilliant, driven, and charismatic, he was likely the most influential figure to never serve as the President of our country. Unlike nearly all other Founding Fathers, Hamilton burst onto the American scene from a most unfortunate childhood. An illegitimate orphan born on a Caribbean Island, he read voraciously and wrote so well that he was employed at a very young age as a clerk by a trading company. After the 1722 hurricane in St. Croix the then-fifteen year old Hamilton penned a summary of the ravaging storm which impressed the editor of the Royal Danish American Gazette. A pastor took up a collection to fund his education in America where he entered King's College (now Columbia University). The immensely-talented young man fought for independence from Britain and became General George Washington's chief aide. He founded our nation's financial system, the United States Coast Guard, the Federalist Party, the New York Post newspaper, and more. "The magnitude of Hamilton's feats as treasury secretary has overshadowed many other facets of his life: clerk, college student, youthful poet, essayist, artillery captain, wartime adjutant to Washington, battlefield hero, congressman, abolitionist, Bank of New York founder, state assemblyman, member of the Constitutional Convention and New York Ratifying Convention, orator, lawyer, polemicist, educator, patron saint of the New-York Evening Post, foreign-policy theorist, and major general in the army," writes Chernow. In the most comprehensive telling of Alexander Hamilton's life, Chernow perused almost 22,000 pages of letters, manuscripts, and articles to reveal a man with unparalleled intellect and ambition. 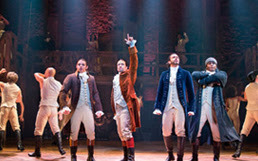 The comprehensive yet never-dull book inspired Lin-Manuel Miranda to create the award-winning Broadway musical that so many have seen and still wait to see. You won't be disappointed by either. Kathleen Barker, features writer. Kathleen was born and raised in Baltimore, Maryland. A graduate of Blessed Sacrament, the Institute of Notre Dame and Towson University, she spent twenty years as the much-traveled wife of a Navy pilot and has three children. While working for a Fortune 500 insurance company in New Orleans, she wrote feature and human interest articles for their magazine and received the Field Reporter of the Year award. After Hurricane Katrina, she returned to her beloved state of Maryland where she started work on "The Charm City Chronicles". All four volumes, "Ednor Scardens", "The Body War", "The Hurting Year", and "On Gabriel's Wings" are available in Amazon's Kindle store. I am going to have to buy this for my father. We are descendants of Hamilton, he was an amazing man. His work with the American Revolution is the building block of today's Army. Thanks for sharing, Donna! Fascinating. As a non-American I have seen numerous television programme about the musical and have been amazed by this man and what I've heard of him. The book is monumental, so I will have to find a quiet time to actually read it, but it does sound amazing. When did Hamilton become so popular of a sudden? I don't get it.